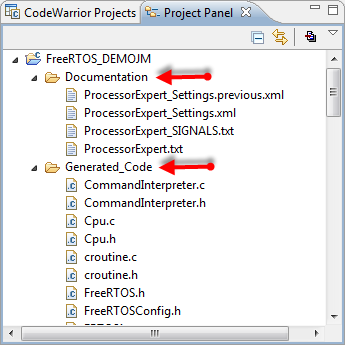 If you are new to Processor Expert in MCU10, and new to FreeRTOS, then you need to learn two new things in parallel the same time. That might be overwhelming. But don’t worry: if you do things step by step and slowly the first time, this much easier than you might think. This tutorial shall help you with this. This is a step-by-step tutorial about how to create a project with CodeWarrior for MCU10.2, Processor Expert and the DEMOJM board. The goal is to create a project from scratch with two tasks blinking an LED. This tutorial uses the DEMOJM board, but in practice any other ColdFire/Kinetis/S08 board can be used as well. 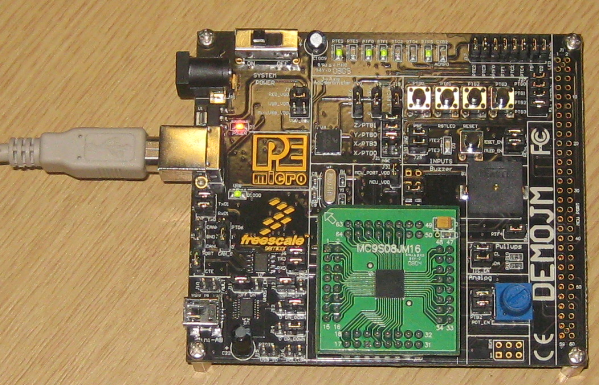 I’m using the Freescale DEMOJM board with the S08 MC9S08JM16 CPU. This board allows swapping microcontrollers (S08JM16, S08JM60 and ColdFire V1 MCF51JM128). The board has useful components (LEDs, buttons, accelerometer, butter) and the pins of the microcontroller routed to a connector, making it a good board to connect with my own hardware. I’m using here the MC9S08JM16 controller with 16 KByte of FLASH and 1 KByte of RAM. Sounds tiny for running it with an RTOS, but not a problem for FreeRTOS :-). The JM16 CPU has a built-in USB feature, but this is another topic with Processor Expert. Hint: using wildcards like *jm16 helps me to select quickly the device. 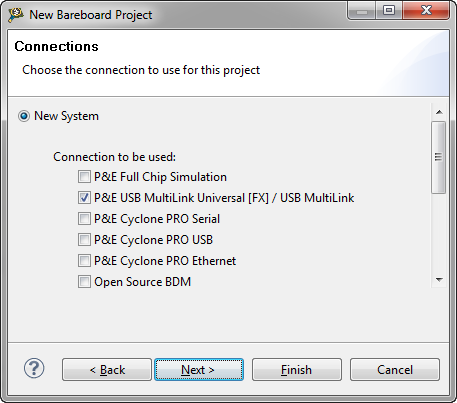 I keep the P&E USB Multilink, as this is the debug interface on board of my board. Project Panel View: shows the ProcessorExpert.pe which contains all the components. Components Library View: Lists all registered components. 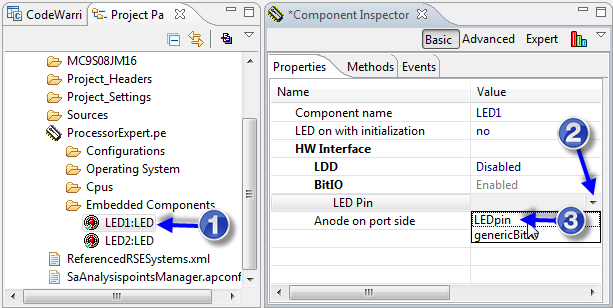 Component Inspector View: For editing the currently selected component. 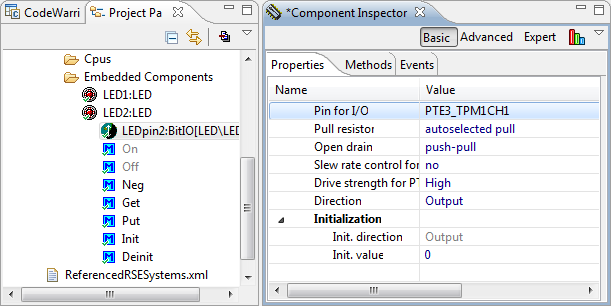 Usually I need to look at the schematics of a board to see to which microcontroller pins the LED’s are connected. The nice thing with the DEMOJM board is that this is clearly labeled: PTE2 and PTE3 are used for the first two LED. I do this twice to have two LED in my project: LED1 and LED2. 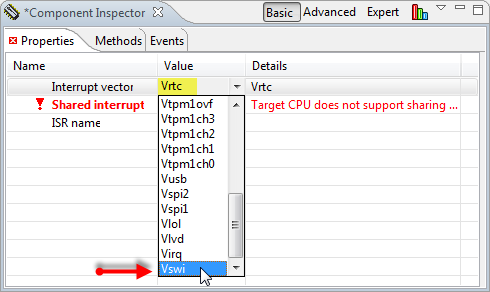 The operating system needs an interrupt vector for so called ‘system calls’: the way how the RTOS can raise an interrupt to initiate a context switch or similar things. This is typically done with a software interrupt instruction or a trap instruction. For the S08 core this is done with the SWI (Software Interrupt) assembly instruction. I have not found an elegant way in the component to automatically change the RTOS Tick Rate (Hz) based on the timer frequency. So it is not ideal to have the setting in two places, but this is how it works right now. For the S08 core the SWI interrupt settings are simple: there is only one vector possible. Startup code (__startup(), initializing memory after reset). Everything I do in main(), including interrupts. Note that I will create tasks in main() and start the scheduler. Hint: how to know how much stack is needed? I use a very simple method: I allocate initially enough stack, then while debugging I write a pattern (e.g. 0xFF) into the stack area using the Memory View. Then I execute my code and immediately see what is changed in memory. This plus a margin of say 10% is then my number. I have it changed here to 100 as this should be enough for my tiny application. Note: the ‘minimal stack size’ is using ‘stack units’ as entity. For the S08 core this is a byte, so ‘100’ means ‘100 bytes’. But for other architectures (e.g. ColdFire or Kintetis/ARM) a stack entry is 4 bytes, so then ‘100’ means really ‘400 bytes’. The generated code will use that value for the macro configMINIMAL_STACK_SIZE which I can use in my code. 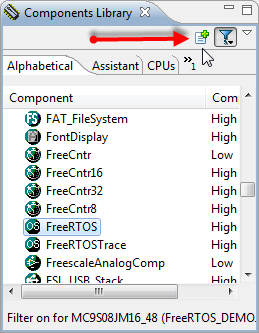 That minimal stack size is used for the FreeRTOS IDLE Task, so should be chosen carefully. But it is possible at run-time to spend more stack for the user tasks at task creation time. Note: Keep in mind that for architectures *not* having a separate stack for the interrupts (like the S08), the stack size should be large enough as well for the interrupts happening at the task execution time. Many weird problems are caused by stack overflows. FreeRTOS has ways to detect stack overflows, but in any doubt it is a good practice to increase the stack size in case of problems to see if this solves a problem. An easy place for this is to add the above code just above main(). Note: FRTOS1_vTaskDelay() is a simple wrapper (a define) to the vTaskDelay() function. You can use both versions as they are the same. Tip: I can drag&drop the method from the Project Panel view into the source file: that saves me a lot of typing. With vTaskStartScheduler() the RTOS scheduler will create an additional internal IDLE task and then run the RTOS. **         This module contains user's application code. **     for the Freescale HCS08 series of microcontrollers. 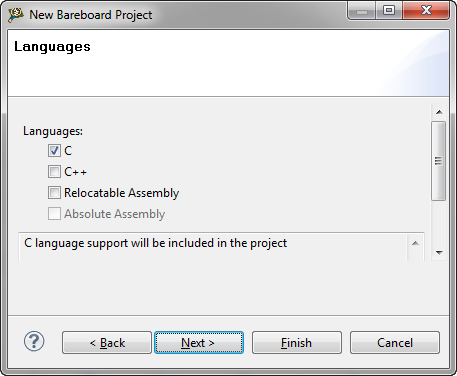 I use select the project in the Project Panel view and use the menu Project > Build Project to compile and link it. This should pass without errors and warnings. Finally, time to run it. 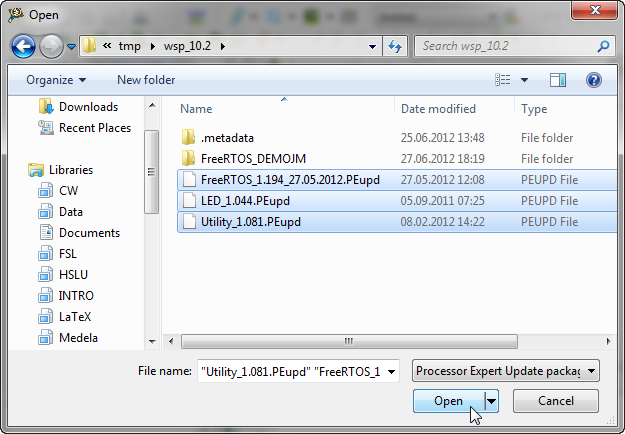 For this again I have the project folder selected and use the menu Run > Debug. Running the application, and now I should see my two LED’s blinking :-). 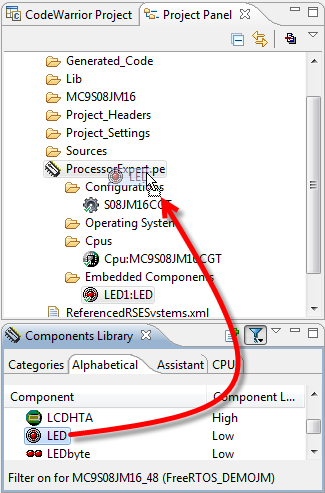 Adding an RTOS to a microcontroller application is usually not easy. If I do not have an example for my board and microcontroller, then this can get time consuming and complicated. With Processor Expert and the FreeRTOS component I have a graphical UI to configure all the important settings (stack, heap, software interrupt and tick timer). And because Processor Expert generates all the RTOS source files and configuration files for me, this makes it really simple and easy. 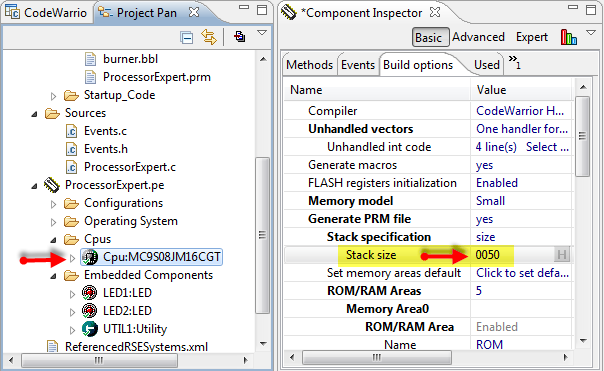 As a starter, I suggest to have a look Quickstart for Processor Expert in Eclipse. 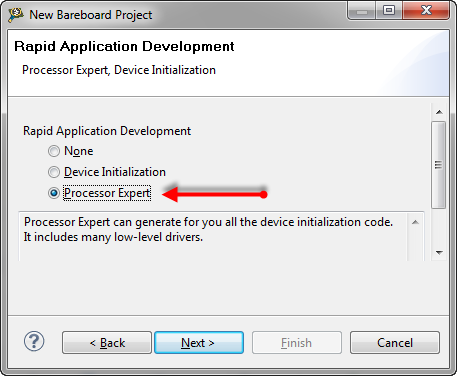 This gives a head start on some aspects of using Processor Expert. 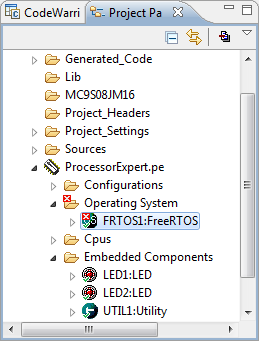 For more information about FreeRTOS and the API, have a look at the FreeRTOS documentation on the web. 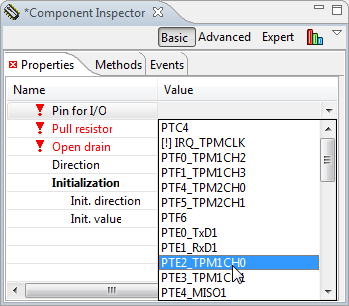 This entry was posted in Boards, CodeWarrior, DEMOJM, Embedded Components, FreeRTOS, Processor Expert and tagged Embedded Component, Processor Expert, Tips&Tricks by Erich Styger. Bookmark the permalink. 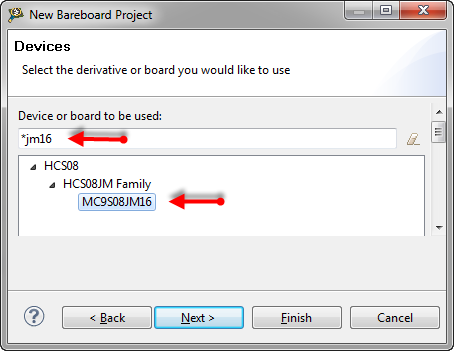 Trying to follow through as close as I can, using my own MC9S08AC128 board, all is good until I to to select the LED Pin – there is no dropdown or other means to select one. 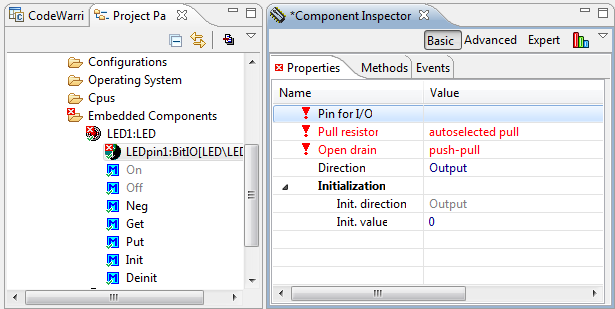 Is there some setting dependency, so there is something I should have done before adding the LED component? Is LDD disabled and BitIO enabled? I see that what you see is a possible UI glitch: unless you click into the field, there is no drop down icon visible :-(. I have not realized that before. I’ll extend the post so hopefully this is more clear. 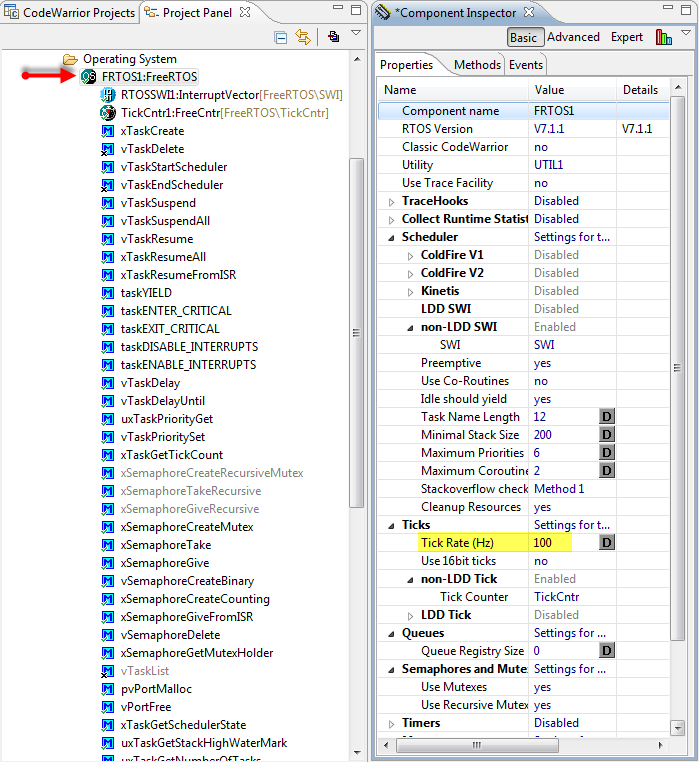 Yes – out of the box, LDD is disabled, BitIO is enabled. 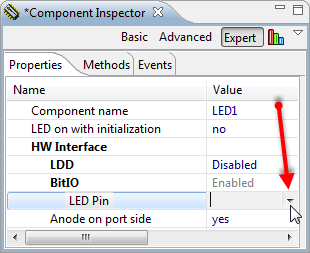 If I click the value column for LED Pin, I get an error, due to the pin being unassigned. 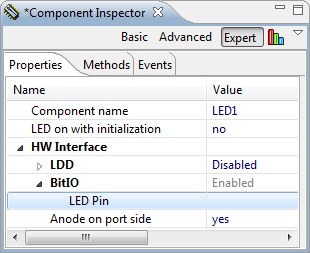 So I go back to Project Panel, expand LED1:LED, go to LEDpin1:BitIIO, then select the pin I require in properties, and all is good. Yes, I didn’t realise I had to click into that field. Now I just have to check my schematic to find what pin the LED is actually attached to! Yes, I have reported that UI problem to the Processor Expert team. It looks like having the drop down box not visible unless you click into it is a problem of the underlying Eclipse UI control they are using. Hopefully this will get fixed/improved in a next version. HI, thank you for your tutorial. 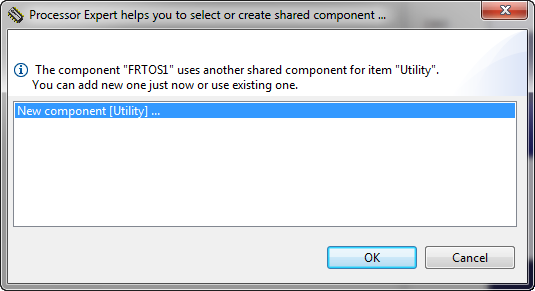 I try use FreeRTOS component, but I can’t. The program always stop on “void FRTOS1_vApplicationMallocFailedHook(void)”. I use a MCF51JM128. Hi, heap size of CPU or FreeRTOS? thank you. 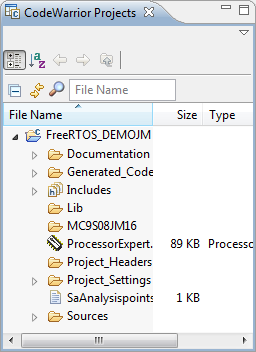 The heap size of FreeRTOS. Great Post! I’ve been trying to get into the FreeRTOS with freescale for a long time until yesterday that i found this post on google. Thank you! Cool! Glad to see that this is useful. This looks very good, and so I am tempted to try to do this on Kinetis. Erich, do you have anything on the Kinetis and FreeRTOS? I have to use the FlexTimer and it is very hard to implement into MQX. The project keeps trapping into the Kernel. I can get the system to work without mqx using device init, but not with mqx. Do you know if it easy or hard to use FreeRTOS and Device Init to run the FTM? I don’t need a driver, I can do all the bit banging for the registers, my problem is this mess with MQX and the integration of the code from Device Init.. because PE is not properly integrated as yet with MQX. It is mainly for Kinetis L, but applicable for K family too. Thank you for this great tutorial. I tried it on my S08JM60 and FreeRTOS opened new horizons to me 🙂 But there is (as always) a problem. I Tried to implement some basic “Process UART Data Buffer” and “Display received Data” tasks. Data buffer is filling up in SCI Rx Interrupt routine. The problem occurs when there is lot of data transfered (115 200 baud rate). Some bytes are missed in communication, and i was able to track the reason to UART “overrun” error. It is heading me to the problem of interrupts priorities. I think that SWI interrupt is taking too long to switch contexts, and doesn’t leave enough time to SCI Rx interrupt to process received data, so overrun occurs. Is there any way to change the priorities so sci interrupt is not missed anymore? Or I am missing some other point there? If you have anything on mind that could possibly help me, please let me know. Thanks in advance. R.
I think the answer would depend on your continuous data rate. What I have used successfully is using the AsynchroSerial Processor Expert component in interrupt mode. That component has a built-in internal buffer. I have set that buffer to a size matching my incoming traffic and depending on my overall latency time. 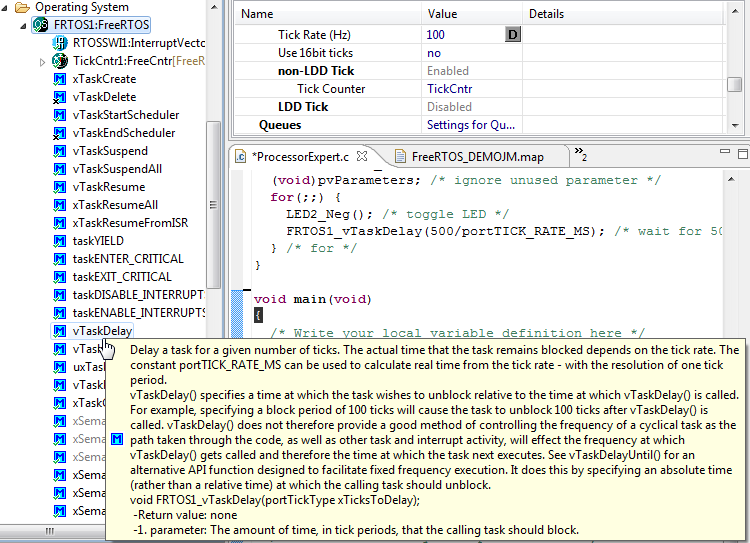 That buffer (say 1 KByte) is filled up within the interrupt routine, while I have a FreeRTOS task to read it out. In my application I storing that serial data to a SD card memory. The bottle neck was usually the SD card interface. Apart of this, profiling your application timing might help. I’m using the FreeRTOS+Trace (I wrote a post on this) for this: that way I see the execution pattern of my application and can tune it to my needs. I hope this helps. Thank you for this great tutorial. I tried it on my S08JM60 and FreeRTOS, i’m using DEMOJM but it’s example does not work, how to configure FreeRTOS heap size, CPU Stack Size and Task Default Stack Size?. Thanks. 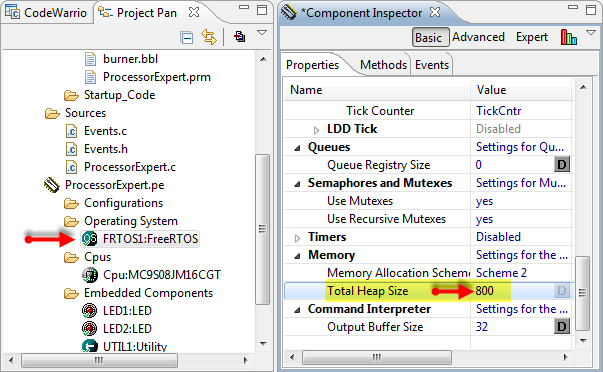 the ‘CPU stack size’ is configured in the CPU component/build options. 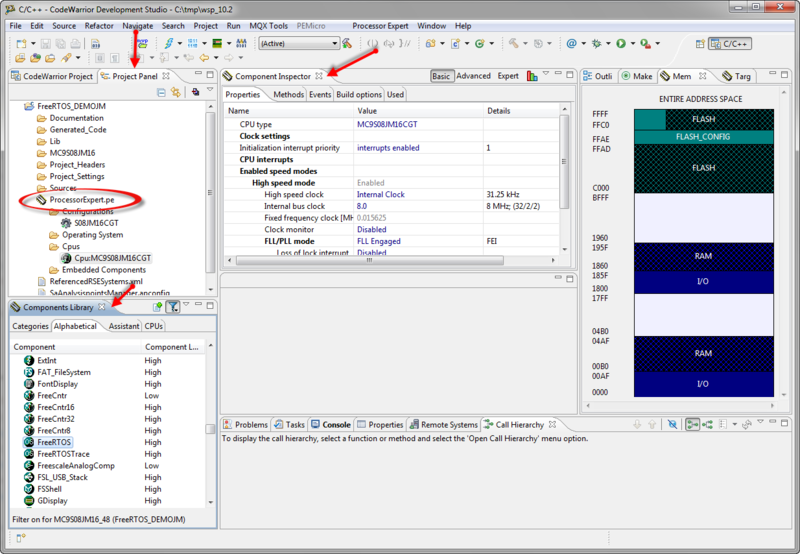 The heap size and task default stack size is configured in the FreeRTOS component itself. I hope this helps, otherwise I’ll publish an example for the S08JM60 on GitHub. hmm, I have indeed found a problem in the S08 port introduced with the latest RTOS version (tickless idle mode support) :-(. I believe I have fixed it, and I want to run some additional tests. I will publish as well an example project on GitHub. I’ll post another comment once I’m done. Sorry about that! I have pushed a fix on GitHub (https://github.com/ErichStyger/mcuoneclipse/tree/master/PEupd), together with an example project for the S08JM60 (https://github.com/ErichStyger/mcuoneclipse/tree/master/Examples/DEMOJM/DEMOJM_FreeRTOS_S08JM60). Let me know if things are working now on your side. Hi, thanks for the tutorial. 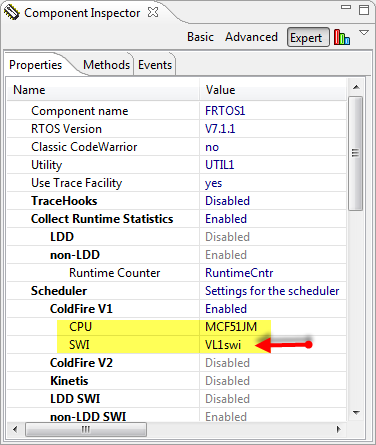 Unfortunately, I’m having some trouble getting FreeRTOS tasks to run on my Coldfire V1 MCF51JM64. I followed the instructions in the tutorial, and it didn’t seem as if my tasks were running, so I tried running the same code in my main. When running this from main, I stepped into vTaskDelay(), then into uxListRemove() (from tasks.c, line 796), and then while stepping through the function, it jumps to the CPU_Interrupt upon executing the line “pxItemToRemove->pxPrevious->pxNext = pxItemToRemove->pxNext;” from list.c line 187. Could this possibly be resulting from some incorrect configuration settings, or maybe a FreeRTOS bug? Any help you could provide will be appreciated. Thanks for the quick reply. I appreciate you uploading the demo project, it does work on my JM64. Also, I believe that the CodeGen number that you are referring to is referring to the number of times that processor expert has generated code for the file, as it was 10 for the first project I tried running, and it is 0 for your example that I imported. good to hear that the project works now for you. And you are right, I used the wrong number. after I changed it, it compiled ok and LED example is working fine on my HW. ups, sorry about this. Indeed, that is wrong for ColdFire V1 (same bug for ColdFire V2). I have fixed it now on GitHub. C:\ProgramData\Processor Expert\CWMCU_PE5_00\Drivers\freeRTOS\FreeRTOSConfig.h, and the change is around line 405. The plan to create new PEx component on GitHub shortly, and it will of course include your fix. Sorry about this, and thanks for reporting! by increasing the heap size from the default 1024 to 8192 (4096 failed as well…) I got the two tasks to work together. It would be much helpful if in the future you will please publish a post about stacks and heaps and related issues. 1)Changed USB multilink to USBDM. UPDATE: I didn’t mentioned that the program build fine, and I can flash the generated .elf file with the USBDM CFV1 flasher. The problem is if I’m running it from CW 10.6. 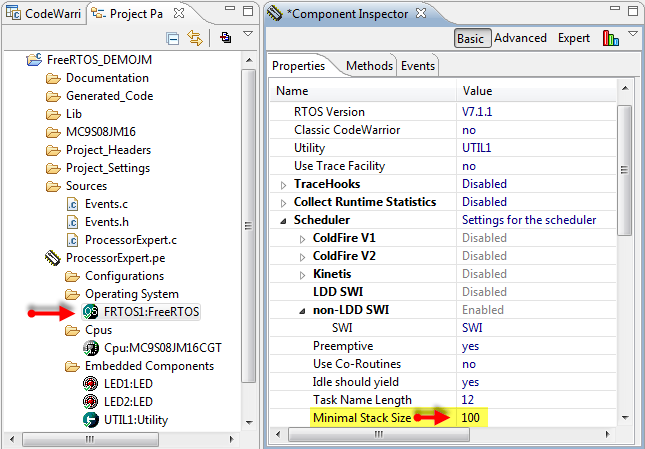 You need to check the .mem file inside the project (Project_settings\Debugger folder). I know that earlier versions of the tools might have created a .mem file with such an overlap. You can fix that directly in that .mem file (it is a text file). Thanks Erich, it’s working now (I also had to change the heap size from 1024 to 8192).